The Buckingham 1500 Pocket Sprung 4ft 6in Double Divan Bed in Cream Damask comes with comfort sleeping range mattress which encapsulates the best of traditional manufacture and modern technology. It is constructed around 1500 count pocket spring unit to provide ultimate comfort and support. Each Spring is sewn into an individual fabric pocket allowing it to move independently and respond to the body's every movement and contour. 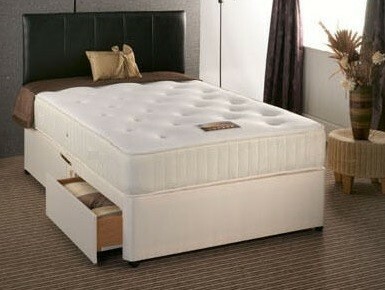 Price includes Divan Base and Mattress with the option of headboard and storage to suit your needs. Upholstered with layers of Hypoallergenic cotton and polyester fillings. Divan Base comes in 2 sections with castors and attachments for headboard. Storage is not included but can be added from above drop down menu. Manufactured in the UK and Complies with BS7177 UK fire regulations. The RH side or the LH side for the storage are from standing at footend of the bed and looking towards the headboard. So ideally, if you require right hand side storage looking from footend of the bed towards the headboard end, you need to select the Right Hand Side option. We can also supply this divan bed with customized size and storage options of your choice. Please Contact Us to discuss your requirement. For the following postcodes we aim to have your order delivered within 2 to 10 working days (Mon-Fri) of your purchase. All orders now come with FREE delivery. Free delivery is only during weekdays, Mon-Fri. Delivery to flowing postcodes will be within 7 to 14 working days and we will confirm delivery date once we will receive your order. We do not deliver to any offshore delivery address. PO area - We do not deliver to the Isle of Wight. KW area - We do not deliver to any of these postcodes. ZE area - We do not deliver to any of these postcodes. BT area - We do not deliver to any of these postcodes. Isle of Skye - We do not deliver to any of these postcodes. For some products there will be extra delivery charge to some postcodes which will be written inside the description for each item. IV area - Please contact us with your postcode before placing your order so we can check any delivery cost. PH area - Please contact us with your postcode before placing your order so we can check any delivery cost. KA area - Please contact us with your postcode before placing your order so we can check any delivery cost.